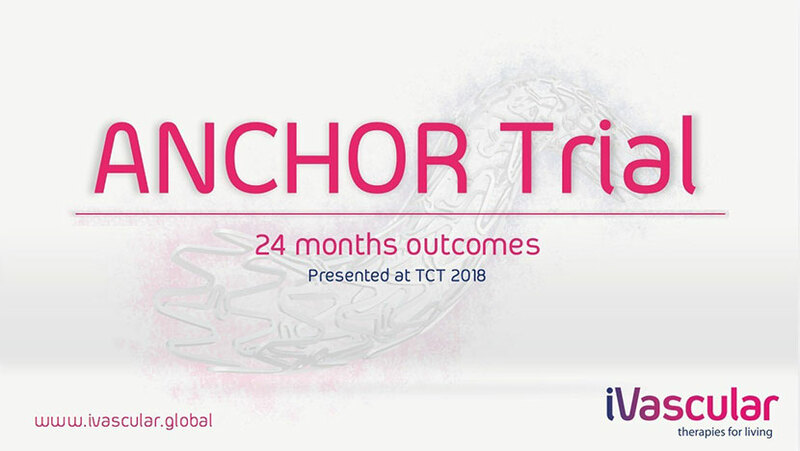 San Diego, September 24th, 2018 – iVascular reveals 24 months outcomes of Anchor trial and presents outcomes of two major RCT at TCT 2018.
iVascular reveals 24 months outcomes of ANCHOR Trial, evaluating the safety and efficacy of Angiolite DES, at TCT 2018. The presentation was made by Dr. Rishi Puri, one of the PI of the study. Primary endpoints of ANCHOR: Strut-level neointimal proliferation at 6-month, Strut coverage at 6-month, Incomplete Stent Apposition (ISA) at 6-month. Anchor trial outcomes were: Target Lession Failure: 0%, Stent thrombosis: 0% Target Lession Revascularization: 1%.The trial demonstrates a favourable early healing profile and is characterized by the absence of binary in-stent restenosis, stent thrombosis and myocardial infarction or cardiac death, suggesting high efficacy. Later on, Prof. Ulf Teichgräber presented the EFFPAC RCT 12-month data. EFFPAC is a randomized prospective multicentric controlled trial that enrolled 171 patients and clearly demonstrates the superiority of Luminor DCB versus POBA in femoropopliteal lesions. Beyond meeting all endpoints, EFFPAC also highlights that Luminor DCB is the only DCB proving statistically significant improvement of patients’ clinical status. Lastly, Dr. Armando Pérez de Prado, presented the ANGIOLITE trial, a randomized prospective multicentric controlled trial that enrolled 223 patients with the objective of demonstrating non-inferiority versus the current Gold Standard . All endpoints were met with statistical significance, confirming safety and efficacy. The 24-month results of the ANGIOLITE Trial are expected to be presented at Euro PCR 2019.